In today’s world and any construction site, contractors can never be too safe. Not only is it important for the workers themselves to be safe so that they may return home each day, but safety is also important for the general public and those on the job sites being worked on. As society as a whole pays more attention to safety for purposes of liability, insurance, and corporate responsibility – quality roofing contractors are taking steps to ensure proper measures are taken to create safe job sites and working environments. Below are five common steps that commercial roofing contractors can take and all of which Peach State Roofing has taken around its nationally located offices to create safe working job sites. OSHA Training Cards – Peach State Roofing has taken the step to have most all of its site superintendents and project managers trained in an OSHA 10 hour training class. By having key site management trained in proper safety classes, job sites can be expected to have safer working conditions for the workers and the building occupants below. Peach State Roofing requires those trained in the OSHA 10 hour training classes to carry their certification cards with them to any roofing job sites. Safety Flagging – OSHA requires safety flagging to be set up on job site roofs 6 feet from the perimeter of the building. As a roofing contractor, this should be the first thing done when loading up and starting a job site. Typically red flagging is used and contractors should stay away from only using caution tape as this is not approved flagging. Flagging off of the roof perimeter, dumpster areas, staging/loading areas, and any other needed locations which may encounter work should always be taken and can prevent dangerous situations. Tie Off Plates – In addition to red safety flagging, OSHA approved tie off plates should be used if needed. 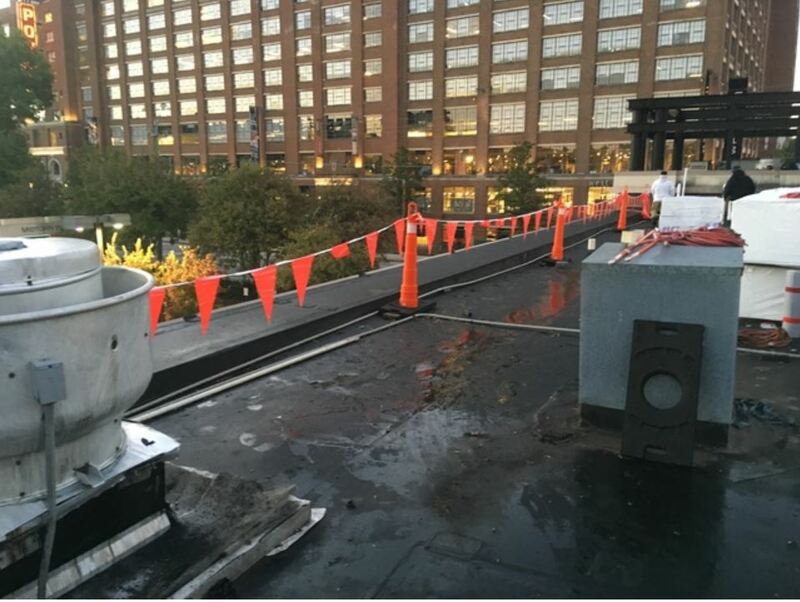 On many new construction or re-roofing projects – certified tie off plates can be anchored directly into the buildings decking system with approved fasteners to allow for harness tie off locations around the building. If an employee is ever working out side of the safety flagging, they should use 100% full tie off requirements. Fire Extinguishers – Fires can be extremely dangerous if they ever occur on a roof due to the limited nature of access and worker evacuation. Commercial roofing systems use a variety of flammable materials such as weathered membrane cleaner and bonding adhesive. The slightest spark during construction or the use of heat generating tools can cause serious fire threats on a job site. Having properly sized fire extinguishers located at numerous areas around the roofing job site are a serious requirement. Proper Safety Attire – It is no question that roofers face conditions that can have wear and tear on the body or cause serious damage to themselves. For these cases, having workers wear basic safety approved attire can help prevent injuries on the job site. Some proper safety attire on commercial roofing job sites typically include things like steel-toed work boots, safety yellow vests or shirts, safety glasses, hard hats, and work gloves. Of course specific job site conditions can warrant other types of safety measures but the basics should always be covered. All in all, it is not hard to implement standards to create a safe work environment for both field workers, management, and occupants of a job site. With a little dedication, on going safety training, and paying attention to detail – commercial roofing contractors can provide quality services with safe work habit practices.